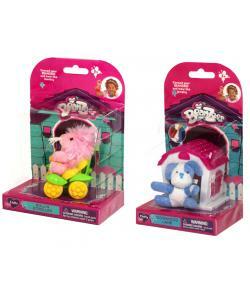 Each pack contains 1 super cute Teenie Beanzees Pet and 1 action accessory. Assorted - Styles may vary. Styles in the assortment include: Boo + Rock 'n Ride Pony, Dash + Swing Along Swing, Mattie + Rock 'n Cradle, Kaly + Ride Along Tricyle, Boppy + Roll 'n Stroller.